I wanted to do something fun with my siblings for Christmas Eve so I decided to venture on my first candy/chocolate creation: peppermint bark. I love peppermint chocolate so I couldn't be more excited when I found out this was one of the simplest candy recipes ever. Next repeat the melting process with your white chocolate chips and pour it on top of the cooled semi-sweet chocolate layer. Now sprinkle the peppermint pieces on top of the white chocolate and gently push them in. You can also mix the peppermint with the melted white chocolate first, but I found this made the white chocolate harden up, so it wasn't that easy to spread when pouring out onto the pan. Now cool for another 40-60 minutes. Enjoy!! 1. This was the first time I dealt with melting chocolate so I first read that using a double boiler is the way to go to make it perfect. I tried this and wow this process was very long and tedious. Plus I didn't read before hand that when melting chocolate comes in contact with any one drop of water, it seizes up instantly and thus makes it unmeltable. So in my double boiler, I had put the boiling water too high and there was so much condensation that it dripped into my bowl of chocolate. Wasted. But apparently this method is what true professionals use to make perfectly smooth chocolate. 2. I said screw it and used a microwave. Like I said before, chocolate burns easily, so you really want to control the heating process and I found the 20-sec interval process flawless. I didn't change the power settings at all. Remember to always use a completely dry spoon or spatula when mixing your chocolate. Plus this method was SUPER quick and easy, just the way I like it to be :) The chocolate turned out to be smooth too, so I really did not see a noticeable difference or lack in quality. Yum! We made this last year and everyone could not get enough! Always a hit... thanks for sharing the recipe and Happy Holidays! 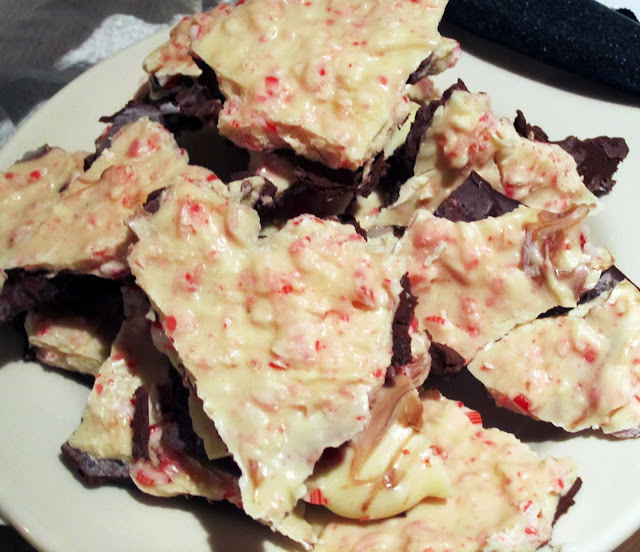 I made peppermint bark very recently, it was yummy. You can see a post about it on my blog if you want to know how mine turned out. Last day to enter the China Glaze GIVEAWAY! Go toI WAS AN UGLY DUCKLING BLOG! This looks great! I want to try it out :) thanks for commenting on our blog, we're now following you on bloglovin! looks amazing! love your blog! mmmm it looks delicious! Thanks so much for your nice msg in IFB and your comment... they totaly made my day. You are so sweet and u have and amazing blog! Mmmh they look good, I have never tried these you know? Come to visit my blog and if you want let's follow each other on bloglovin and GFC! I received your message for me at IFB, I am really glad to hear from you.. I will keep up my work..
Stephanie, thank you so much for your comment! I love your blog name! My biggest piece of advice is to get yourself out there, when I first started blogging I commented on many, many blogs and regularly commented people back! I think it's good to be connected with your readers, it keeps them coming back. I also didn't start posting my blog link on my Lookbook until months later, and once I did, I noticed traffic increased immensely. So make use out of any other social media site you have like Twitter, etc.! And of course, have your own unique voice, because so many blogs out there are such identical copies of each other that sometimes they start getting really repetitive. I am following you back on both, Can't wait to see a new post of yours! peppermint bark is so yummy! This post is great, I love it :) now following. I love peppermint bark! I want to go make some now!